While I think that Repo! The Genetic Opera (2008) is a valiant effort, I am clearly not its demographic. The first time that I saw it, which was almost a decade ago to the day, I apparently enjoyed it more because this time I found most of it unbearable and gave it a full star rating lower. I guess it appealed more to almost 29 -year-old me more than almost 39-year-old me. 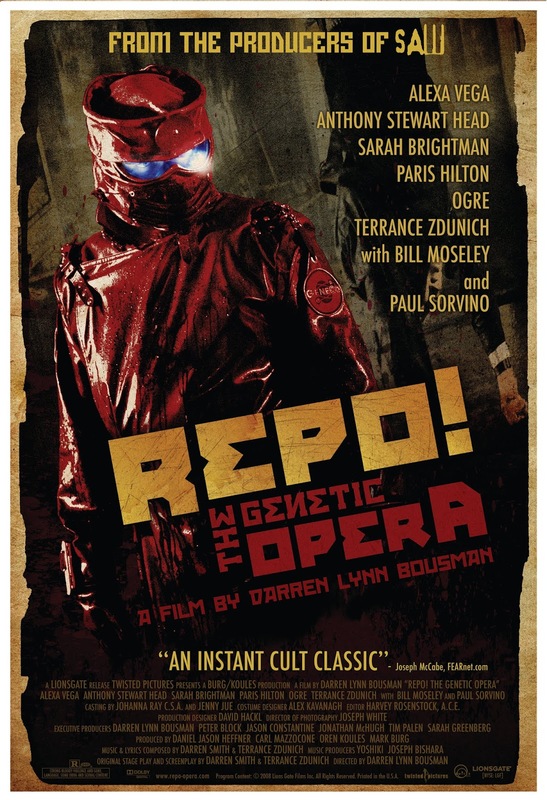 There are certainly things about Repo! that I like. The basic concept of the story is interesting and unique—that of a future where an epidemic of organ failures devastates the planet, a biotech company called GeneCo offers transplants, but those who miss their payments are scheduled for repossession by Repo Men; surgery addicts are hooked on painkilling drugs, murder is sanctioned by law, and a young girl searches for the cure to her own rare disease as well as information about her family's mysterious history. The cast is diverse, weird and some parts are pretty funny. I don't hate musicals either, if the songs, production design and costumes are strong. But it's here that Repo! fails for me (in one aspect, of many). The. songs. just. aren't. good. Not the lyrics and not the music. What's even more annoying is that the characters sing lines that don't even turn into full songs. What's the most annoying is that the vocals are obnoxiously loud so that every song is heavily "up front" in the sound mix. Not to mention that when you cast Sarah Brightman (an actual opera singer), everyone else's singing is going to pale in comparison. I'm also not a fan of the look of the film—it's all heavy filters, unnatural color grading and the shots aren't framed particularly well a lot of the time. Additionally, the CG f/x aren't very good (though the practical f/x are) and the look of the characters/environment is Hot Topic goth meets steampunk meets Z-grade Blade Runner (1982). I get what Repo! was going for—a modern day Rocky Horror Picture Show (1975), but it just tries too hard to achieve the same level of camp and cult status without success.